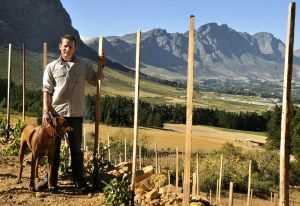 Chamonix Wine Farm is nestled against Mont Rochelle mountain, deep within the rich wine-growing valley of Franschhoek in the Western Cape. Formerly part of historic La Cotte granted to the Huguenots in 1688, Chamonix today comprises some 300 hectares. German-born Chris Hellinger purchased the farm in the early nineties when it was predominantly an export fruit farm. With tenacity and vigor a replanting program began, steadily replanting fruit trees with noble French varieties of vines and with an engineering background combined with old world principles an underground cellar was built. An underground passage leads one through the cellar up into the Blacksmith’s Cottage, built in the late 1700s which now houses the Winetasting Room and Sales. Chamonix has around 50 hectares under vineyard. As purists, they believe that to produce a wine of character, containing all elements of grape, unique terroir, and process, it is essential that only Chamonix grapes are used. Against the mountain, the farm benefits from cool breezes during hot summer months and stony, clay-rich soil, giving the wines the unique personality and character which make up the Chamonix story.